I was born in this little town of Andalusia and I love it. One day, after having spent many years travelling and searching for my “Shangri-La”, I found out that that was in my town of birth and I went back home to open our little hotel and to form my family. Ronda is an adorable place, where life follows a slow and human rhythm. It´s embedded in a plateau and divided by a deep gorge of 100 m height. It is surrounded by three Natural Parks and has a history as long as the history of mankind. The poet Rainer Maria Rilke called Ronda “the City of Dreams” and many other romantic travellers and writers of the 19th and 20th century from all over the world had seen it as an example for the essence of Andalucia. Its friendly people, the tradition, the blue skies and the mountains surrounding it, make it a magical place. Today, Ronda is a modern city, with approximately 40.000 inhabitants, that´s situated in the centre of Andalucia and is a perfect base for spending your holidays and visiting from here all the big cities and touristic destinations that are worth seeing in this land. Historically, Ronda is populated since the prehistoric era, the cave “Cueva de la Pileta” is an example for that. Iberians, Greeks, Phoenicians, Carthaginians, Romans (Acinipo, also called “Ronda la Vieja” -Old Ronda- was the roman capital of this area) and Visigoths passed by. In 711 AD the Muslim era began; from that period we can visit the Arab baths, the “Palacio de Mondragón”, and the “Casa del Gigante” (House of the Giant). In 1490 Ronda is conquered by the Catholic Monarchs and great churches and palaces were then constructed, like the one of Salvatierra and Santa María la Mayor. 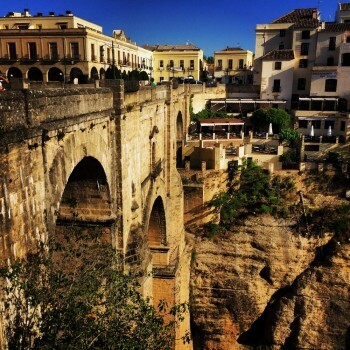 Only after the 18th century, when the famous PUENTE NUEVO (the new bridge) was finished, Ronda became the city that we can see today, with the “Plaza de TOROS” (the oldest bull ring in Spain) and the modern part of the town. After the Napoleonic occupation, Ronda became famous among the “romantic travellers” (Washington Irving, Prosper Merimée, Edmond Boissier, etc.) who made the portrait of the “bandoleros” (bandits) and traditions of this area to be identified as the sole of Andalucia. 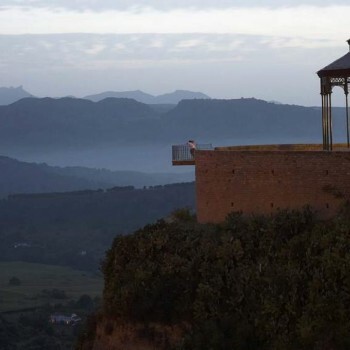 With reference to its spectacular nature, Ronda is a privilege region for hiking, cycling and birdwatching, given that it is a mountainous area with large Mediterranean forests. We have various botanical endemism, like the “pinsapo” (Spanish fir) forests and one of the best conserved Mediterranean forests of Europe. 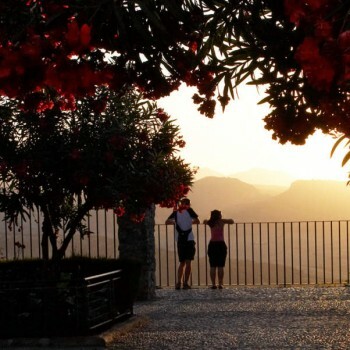 Despite being situated in the south of Andalucia, Ronda has a continental climate, which enables milder summers than in the rest of the region, as well as a moderate spring and autumn season, full of flowers and wildlife. We even get snow in winter, which guarantees enough water reserves to keep the area green and fresh during the rest of the year. For all this, Ronda is an excellent choice to spend your nature holidays in Andalucia.